Welcome to our pick of the best fax machines money can buy. Now, many of you may be thinking "who needs a fax machine in 2019? ", but you may be surprised to know that many businesses still rely on fax machines to quickly and dependably send documents and correspondence between offices. If you own or work in a business that still uses faxes, then this guide to the best fax machines in 2019 will be for you. Don't think just because faxes are becoming less common it means you need to stick with an old fax machine. In 2019 there are plenty of modern fax machines that come with a host of other features. 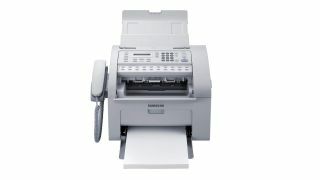 With wired (Ethernet/USB) and wireless (Wi-Fi/NFC) connectivity, duplex printing, decent eco settings and support for a wide range of media, the Samsung M2885FW is an excellent all-rounder, and one of the best fax machines you can buy in 2019. As it's a 4-in-1 device, it can handle printing, scanning and photocopying as well, so if you don't need those, then this is a bit overkill. However, if you're looking for a fast laser printer and fax machine for a busy office, it's a brilliant choice. If you're looking for the best fax machine for a busy and large office, then the Brother MFC-L6800DWT is definitely worth investing in. As a laser printer, it's incredibly fast, but maintains a high print quality, and it comes with a large range of connectivity options to work as a fax, including USB and network. As a fax machine, it offers 33.6Kbps speeds, as well as fax forwarding, automatic redialling and group dialling features. If you're only looking for a fax machine, then you don't want to spend extra money on an all-in-one printer that will offer you features you'll not use. If you just want a fax machine, then the Brother FAX-2940 is the best dedicated fax machine money can buy. As primarily a fax machine, it offers plenty of great features including 200 speed dials and up to 500 pages of transmit/receive memory, which means you won't miss out on any faxes if the Brother FAX-2940 runs out of paper. You can also download a free printer and scanner software update that turns it into a multi-function device. If you're looking for a dedicated fax machine and don't mind (or even prefer) a rather old school design, then the Samsung SF-760P could be the best fax machine for you. It's got a no-nonsense design that sums up what we like about this fax machine so much. It's dedicated to sending and receiving faxes, and that focus means it excels at its job, offering plenty of features and a decent 33.6kbps fax transmission speed. It can also be used as a printer and scanner, but we'd recommend only using this for faxes.